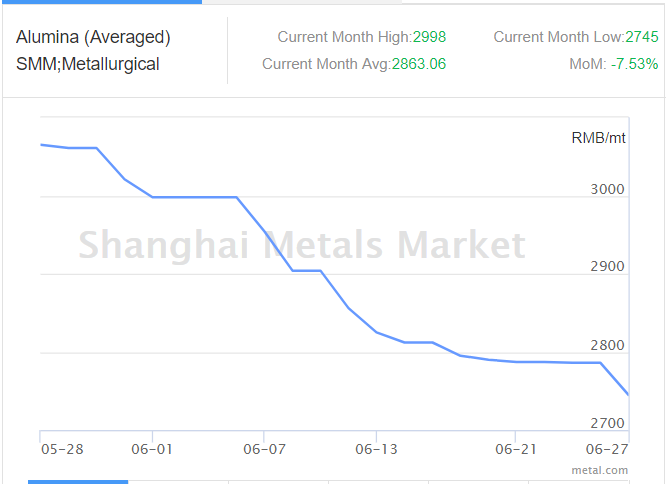 After rallying at RMB 2786 per tonne for two days in a row on June 25 and 26, alumina spot price plunged to RMB 2745 per tonne in China today, on June 27, 2018, according to Shanghai Metals Market. The average price is expected to hover at RMB 2745 per tonne. 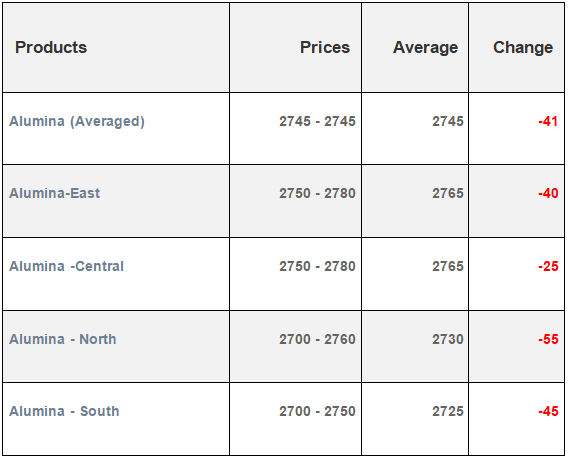 In the east, the alumina price dropped to RMB 2765 per tonne today after hovering at RMB 2805 per tonne on June 25 and 26, while the average prices are expected to range between RMB 2750 and RMB 2780 per tonne. In the central, on the other hand, the price dipped to RMB 2765 per tonne from RMB 2790 per tonne from June 19 to 26, with average price same as in the east. In north and south, the prices declined from RMB 2785 per tonne to RMB 2730 per tonne and from RMB 2770 per tonne to RMB 2725 per tonne. The average prices are expected to range between RMB 2700 and RMB 2760 per tonne, and RMB 2700 and RMB 2750 per tonne. 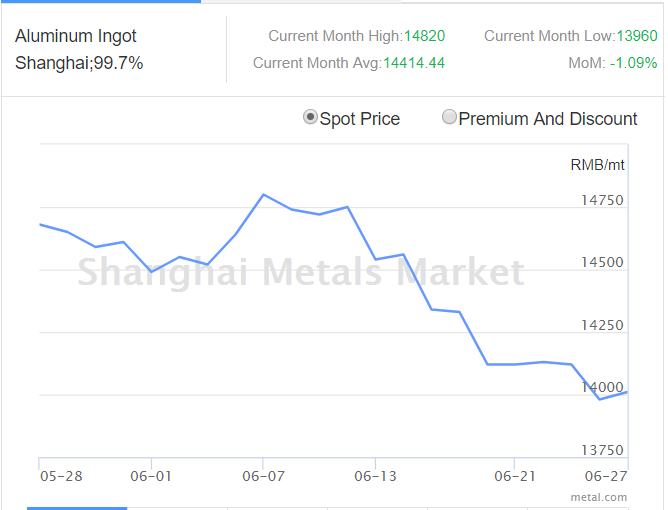 The A00 aluminium ingot spot price increased today, on the other hand, from RMB 13980 per tonne to RMB 14010 per tonne after declining on the previous day from RMB 14120 per tonne, SMM believed. The average ingot price is expected to range between RMB 13990 and RMB 14030 per tonne, with spot discount to settle at RMB 90 to RMB 50 per tonne. Almost all the major Chinese markets witnessed a rise in A00 aluminium ingot price, as in the east and south, the prices grew from RMB 13940 per tonne to RMB 14015 per tonne and from RMB 14060 per tonne to RMB 14130 per tonne. The primary aluminium price in the northern China also increased from RMB 13990 per tonne to RMB 14030 per tonne.